Becoming is a print installation investigating the possibility of a rhizome model to communicate ideas on identity and belonging. 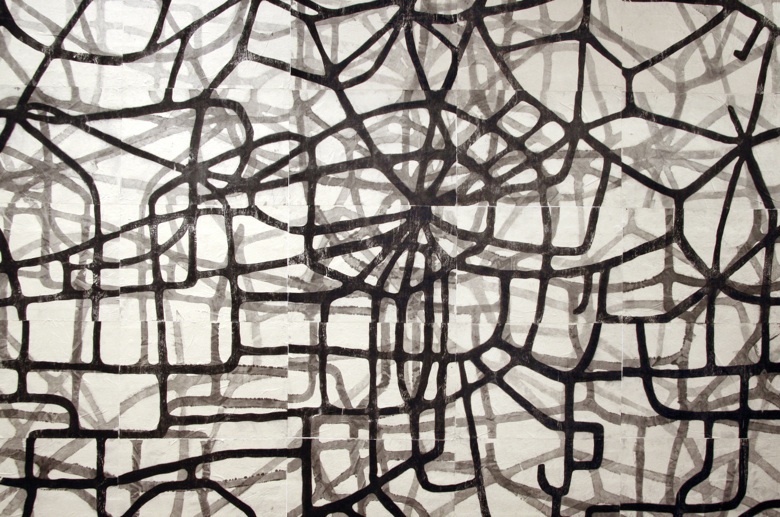 My print follows Deleuze’s concept that a rhizome is similar to a map. It can be detachable, connectable, reversible, modifiable and have multiple entryways and exits. I have developed the work from meandering through long grasses following animal tracks on Gundaroo Common. This site, set aside for villagers to raise cattle on as well as for the preservation of native flora and fauna, shows the potential for continuing negotiations between people and place. The prints are based on Japanese woodblocks and are hand printed from jigsaw woodblocks. The thin Japanese paper reveals the traces of the printing process accentuating the horizontality of the technique. When this is placed vertically it questions our own vertical stance in the world. Are we above or below ground, floating or buried? The work can be pasted to the wall and floors with rice paste. Or they can be pinned, hung, slung or laid over the floor in an interaction with the space allocated for the work. Importantly for me, the work enters into the real space as it takes on the wall of the gallery; it is not an illusion. The rhizomes travel up the wall, hinting at the walls eventual demise back into the earth. As with Deleuze’s rhizome theory, this work has multiple offshoots, each section can break away and become a new one, there is not a linear progressive path but many possibilities in many different dimensions.